I am returning to the Corn Exchange this afternoon. Fantastic place to stop for a coffee and listen to Italian Neapolitan, Tangos, Flamenco, South American, Jigs and Reels and whatever I feel like! My entire repertoire is memorised and I once won a competition to see how long we could play without repeating a tune! How long? … nearly 7 hours. Welcome to Yorkshire is the latest Hollywood style signage that has appeared on the hillside on the opposite side of the valley to our house. This is all part of the hype which is leading up to the Grande Departe next month. There has been a noticeable infusion of cyclists appearing in the local area and both Dave my husband and I are somewhat bemused by all the publicity, hard work, enthusiasm (and expense) which has gone into getting the area ready for the spectacular which will last a few minutes as it whizzes through our village . I have been asked to perform at a venue on the weekend but I am unable to actually get out of our Farm on that weekend so I have had to turn the work down due to the numerous road closures which surround us on all sides.Whilst we welcome the cyclists and will be waving our flags enthusiastically on the day. It has to be said we will also welcome the Grande departure of the Welcome to Yorkshire signage which is right in our field of vision every time we leave our front door . I am trying to coax some more tone out of a harp I made last year. It takes about 2 weeks to make the frame and about 6 weeks to load 2 1/2 tonnes of stress, 122 strings and get it stable. It takes a good 6 months of constant tuning to keep it stable and only then can you listen! No matter how you try to replicate a favourite harp they are all different. Suddenly when they are 2 or 3 years old they start to ‘sing’. They then get better and better – just like a good wine and they’ll go for months without tuning. Our goat got threatened with an ASBO. My plea that he was weeding everyone’s gardens wasn’t accepted alas. However everyone did agree he was a wonderful, gentle chap and his noncholent way of laying precariously on top of walls waiting for the school kids to come home was loved. His ability top scale the highest obstacle has meant he is now on a tether. He is eating his way around the field in circles. If I was clever I would have planned the 2 wheels of a bike to make yet another picture on the land in honour of the Tour de Yorkshire. We have helicopters over every other day now filming. I’m sure that next time you see another feature on TV and the letters spelling words in the field you will spot Dennis and his crop circles. Trying to clap the rhythm with a pupil today and Lils, the parrot joined in – perfectly, beating her foot as well. When we had finished she said ‘Good girl’ and gave us a kiss! Apologies for not updating my blog sooner but I have had a extremely busy few days. On Friday I performed at a wedding at a local venue . 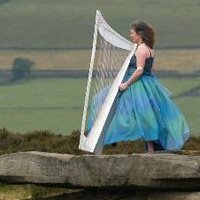 I was extremely pleased to be asked to play at this wedding I had met the Bride and the Groom beforehand at my home which is something I sometimes do in order to get a much better idea of what the couple want at their wedding. I wish the couple all the very best and a long and fruitful life together. It took me a lot longer than normal to get home as a incident in Keighley had occurred where someone had been injured . A article will be appearing in the Telegraph and argus shortly about me , my harps and my life so look out for that.